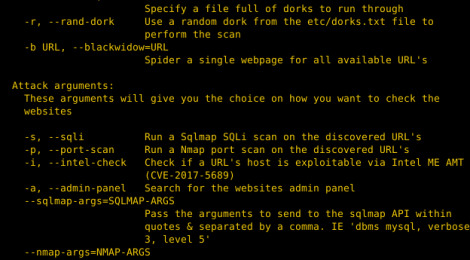 Browse: Home / Zeus – Advanced dork searching utility. Zeus is a advanced dork searching tool that is capable of bypassing search engine API calls, search engine captchas, and IP address blocking from sending many requests to the search engine itself. Zeus can use three different search engines to do the search (default is Google). Zeus has a powerful built in engine, automates a hidden web browser to pull the search URL, and can run sqlmap and nmap scans on the URL’s. + Firefox web browser is required as of now, I will be adding the functionality of most web browsers. + If you want to run sqlmap through the URL’s you will need sqlmap somewhere on your system. + If you want to run a port scan using nmap on the URL’s IP addresses. You will need nmap on your system. + Gecko web driver is required and will be installed the first time you run. It will be added to your /usr/bin so that it can be run in your ENV PATH. + selenium-webdriver package is required to automate the web browser and bypass API calls. ← BOVSTT – Buffer Overflow Vulnerability Services Tester Tool.